It seems like Gameweek 34 was a dream for some but an absolute disaster for others. In fact, we’re pretty sure a LOT of FPL managers committed the ultimate fantasy football crime and actually missed the early Friday deadline. But don’t worry, this won’t this time around. With a lot of double gameweek fixtures coming up in Gameweek 35, Nathan and Joe have some tips with how to get ahead of the game when it comes using your wildcard and bench boost chips. Plus, there’s a fight almost breaks ... See More out after the debate rages on as to whether Eden Hazard is the best FPL player this season or the most inconsistent headache of a player for any fantasy football manager. 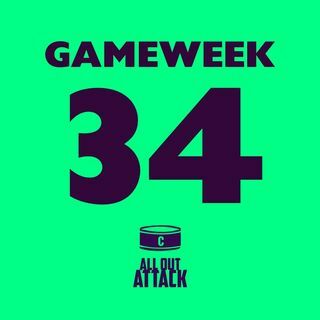 It’s time for you to get ready for the next Gameweek and the All Out Attack boys are here to help you out! Subscribe, give us as many stars as you can in the time it takes for Kane to recover from his injury and follow us on Twitter at @AllOutAttackFPL. Thank you, enjoy and as always good luck in Gameweek 34.